Search for the most fun ski resorts in New York, where you can enjoy a beautiful weekend on the slopes. View our complete guide to New York ski resorts. Find places to go skiing in NY that are perfect for family vacations and romantic getaways. One of the Great New York Ski Areas! A premiere family ski resort in New York, Gore Mountain is nestled in the beautiful Adirondack Mountains. 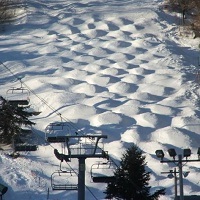 The mountain contains more skiable acres than any other mountain in the state. For over 75 years, the resort has offered nothing but the best customer service to all its guests, treating them all like family. Gore Mountain always stays at the cutting edge of technology, with top-of-the-line lift services and snowmaking equipment. Take advantage of one of the affordable "ski and stay" packages or find lift ticket specials on the website. On the site you'll also find a long list of dining options both at the resort and in the nearby vicinity. Skiing, Snow-tubing, and other Activities! Located in New York's picturesque Finger Lakes Region, Greek Peak Mountain Resort is a fun NY ski area with such activities as skiing, snowboarding, cross-country skiing, snowshoeing, and snow-tubing. Ski lessons are available, including ones for kids as young as 3. If you need any winter sports apparel or accessories, stop by the ski shop--offering the latest fashions for the entire family. When you get hungry, stop by Orion's Pub--featuring sit-down lunch and dinner menus. For a quick lunch, you can grab a bite to eat at the A-Frame Lodge. Or bring your own lunch to the picnic area. Check the website for special offers, including season pass discounts. Whether you are a beginner or an experienced skier, come to Catamount Ski Area for some of the best skiing in NY. It is located on the Massachusetts / New York state line, and it is one of the oldest original operating ski areas in the Northeast. The ski center features 33 trails and park areas, 6 lifts (1 quad chairlift, 1 triple chairlift, 2 double chairlifts, and 2 wonder carpet), snowmaking machines which cover 99% of the terrain, 4 snow groomers, 1 winch cat, a pipe dragon, hotels, and much more. Hours of operation: Monday to Friday 9 am – 4 pm, Weekends and Holidays 8:30am - 4pm. The hours are subject to change due to weather and snow conditions. For more information, visit the website. Get the ultimate skiing experience in NY by visiting Windham Mountain in the beautiful Catskill Mountains. 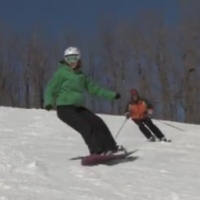 Since 1960, Windham Mountain has offered the best skiing and riding you can find within 200 miles of NYC. 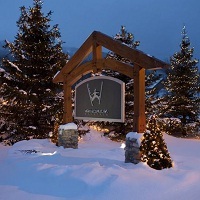 Readers of Ski Magazine ranked Windham Mountain as New York’s most accessible resort for two years running (September 2010 and September 2011). Windham Mountain features snowmaking machines which cover 269 acres (97%) of the skiing terrains, 1600 vertical feet of skiing and riding, 49 trails, 10 lifts, 5 terrain parks, and much more. Hours of operation: Saturday, Sunday and holiday periods 8 am – 4 pm, Monday to Friday and non-holiday 9 am – 4 pm.